Even though you are only moving locally, there are still many important tasks to complete before your relocation. Packing is one of the most dreaded and stressful aspects of moving--whether you are moving a thousand miles or a mere block away. If you are planning a local move, read on for some tips on how to pack your belongings quickly and effectively. The most important part of packing is having the appropriate supplies. To properly wrap and protect your belongings, you'll require sturdy, durable materials. High-quality moving boxes. You can either purchase professional moving boxes for a moving supplies retailer, or hunt for freebies on your own. Just beware--free boxes will not have the same strength and integrity as new ones. If you do opt to go the free route, check out your local grocery, liquor or book store--these establishments have the strongest boxes and are usually willing to let you take your pick. Packing paper. Professional packing paper or unprinted newsprint is used to wrap your belongings and protect them from damage or scratches. Bubble wrap. For your most fragile items, the protective air pockets in bubble wrap will keep your breakables enveloped in cushioning. Packing tape. Strong packing tape is important to keep your boxes securely closed and prevents collapse or lost items. Markers. You will need dark, clearly readable markers to label your boxes by room and indicate which ones contain fragile items. Even though local movers don't charge you by the volume of your goods, you'll still end up paying more if it takes longer to load and unload the truck. Before a move, it's always cost-effective to get rid of old junk and unwanted items to decrease your moving bill. Have a garage sale, sell items online, donate to charity or simply pass them on to friends and family. Not only will you save some money on your move, but you will have less useless junk cluttering up your new home. To keep your life as undisturbed as possible, always remember to first pack the items least crucial to everyday life. If you begin by stuffing your pots and pans into a box and taping it up, you'll realize that cooking will become extremely difficult. Begin by packing things you don't use every day, such out-of-season clothing, books, DVDs and CDs, collectibles, knickknacks and decorations that have no utility or serve no purpose other than ornamental. As moving day draws nearer, you can start packing your bedding, cookware, toiletries, and other daily essentials. Local movers charge by the hour, so the less time they spend loading your belongings into the truck, the less money you spend. If you have opted to pack your own belongings (rather than pay extra for packing services) make sure everything is boxed, taped, labeled and ready to go when the movers arrive. Consolidate all of your boxes in one room to further streamline the process. If you have a lot of furniture to move, you can speed things up by handling some disassembly on your own. However, unless you are confident in your ability to successfully take apart your furniture without damaging the piece or sustaining injury, it's best to leave the task to professionals. You may not be going far, but all it takes is one bump to send your delicate wine glasses crashing to the floor of the moving truck. 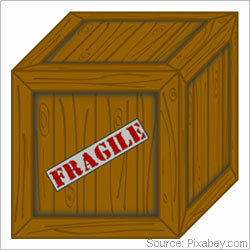 Packing fragile items properly is important to protect them from cracking, shattering, or sustaining scratches. Don't rush. Moving is stressful--you will be juggling numerous tasks in the days leading up to your move. However, packing your fragile items requires care and diligence. Get your breakables packed up first to avoid hastily rushing through the process the day before your move. Use sufficient padding. When your crystal wine glasses or china plates are wrapped and placed in their boxes, there should be no negative space allowing them to shift during transit. Be sure to fill any empty space with crumpled packing paper or foam peanuts to keep your items stationary on the moving truck. Test your padding's effectiveness by (very carefully) closing the box and shaking it. If you can hear your items moving inside, you need to add more padding,. Label properly. Always label any box containing delicate items "fragile" and "this side up". This will ensure the movers are careful when handling these boxes and always carry and set them down in the proper direction. If you are moving locally, you will likely be driving your vehicle to your destination. This means you can pack your car with belongings you want to (or have to) leave off of the moving truck. There are some items that are prohibited or discouraged from transport by the movers, either because they are dangerous or irreplaceable. If you are planning a local move, the most important task on your list is finding a reputable and efficient moving company. To begin comparing quotes from professional local movers in your area, simply fill out our fast and easy quote form. You will receive up to seven free, no-obligation moving quotes from reliable local moving services near you!